Beatles fans still waiting for the band's digital catalogue to appear on iTunes may have to wait for Apple Corps to come to a deal with Apple Inc, but if you are a musician with an iPhone who wants to learn the Fab Four's songs, help is at hand. Containing the first officially-licensed Beatles material to appear on iTunes, The Little Black Songbook includes complete lyrics and chords to over 160 Beatles classics. Each song also has its own guitar chord library where you can view enhanced details and play audio samples of chords used. 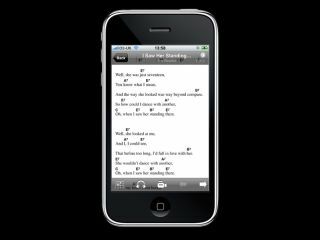 The app also contains 30 professionally recorded backing tracks to play along to, and even a few instructional video lessons to help you learn the songs. The Beatles: The Little Black Songbook can be downloaded from the iTunes App Store here. And the price? Just £3.99 in the UK.